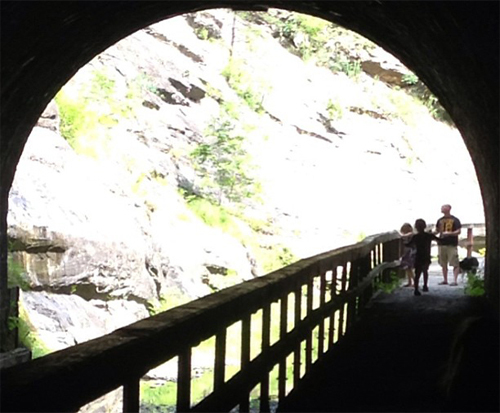 Last weekend we loaded the girls and the puppy up and headed out to the C&O Canal for a little hike and a visit to one of our favorite West Virginia destinations — the Paw Paw Tunnel. This 3,100-foot man made tunnel goes right through the mountain, and while it’s very dark in the middle and wet and muddy at times, it’s a pretty fun adventure! On the other side of the tunnel, we spent some time watching the minnows, dragonflies and other creatures in the canal before turning around to do it over again. Overall, everybody did really great, although my hips weren’t too happy about the 3+ miles we walked, and I’ve been paying for it ever since. Oops!